Can carmakers learn from the open source industry? Yes, if they build a strong business model around it and throw away discarded business practices. When we think of open source, we think of difficult to install UNIX and Linux systems. However, the open source movement has a great advantage over closed source products, millions of coders work independently for free to better products and grow the list of functioning devices. Could this help the electric vehicle industry with its myriad of new technology an old car industry might not be best suited for? You bet, but only with a rock solid and bullet proof business model. Open Source To Lower Costs. When we think of cars, open source is not the first thing that pops in minds. After all, the auto industry is closed source, each manufacturer jealously safeguarding their products from others. However, a closer look at some of the successful business models built around the Open Source movement could prove helpful. Companies such as Red Hat have made a reputation for themselves selling open source software only charging for maintenance and tweaking codes. Crowdfunding could be a useful tool for open source entrepreneurs such as this project GizMag is reporting on a daring electrical engineer using it to develop his electric vehicle kit. Gary Krysztopik is now close to fully releasing his battery on wheel 3 wheel EV, the EZ-EV as an open source build-it-yourself kit. See below for Gary’s interesting idea. Technically Speaking. Gary’s design is simple, a central battery box with a frame to support two seats resting on an advanced honeycombed composites fiber glass tub. Using a 32 kWh battery pack with 96 lithium batteries, the EV sports power steering, disc brakes and modern suspensions. This street legal and highways capable 1,500 lbs EV can be built by one person in a week. Using off-the-shelf components, this projects lends itself perfectly to an open source approach. The end result is a 80 mph EV that can drive up to 150 miles depending on your choice of battery and electric motor configuration. Is his platform the ideal solution, certainly not, the battery pack in front is not the perfect place. However, the fact that is is open source means that you and I can change all of this. To simplify it, we use his platform as a starting point, give him credit and change it. Gary isn’t alone in open sourcing. 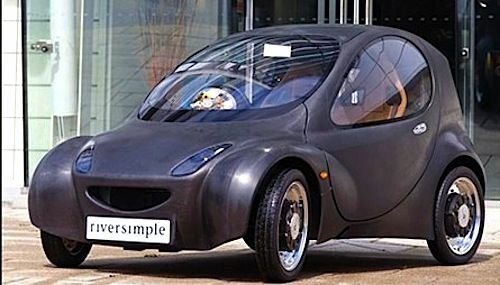 A few years back, a small British company called Riversimple had similar plans for an open source design of a small and lightweight rolling platform ideally suited for an electric drive, and at the time the much talked about hydrogen drivetrain. Using CrowdFunding. Gary has chosen the Indiegogo crowdfunding site to help bring his product to the market. So far $10,000 will get you a rolling chassis kit, $7,500 secure a full-size frame and $1,000 will get you a quarter-scale EZ-EV model. Other levels will give various ways to support the projects. Let’s imagine if Subaru had done this instead of going to Toyota to build the BRZ? Can Carmakers Learn Something From Open Sourcing? Yes, they can, just watch computer makers. It’s no surprise to find UNIX in both Windows and OSX, as well as linux in today’s EVs, whether it be in the infotainment system or sophisticated algorithms controlling battery efficiency. Using open source elements would be a simple way to cut down on development costs and accelerate EV introduction to the general public at a reduced cost for car buyers. Open sourcing is still seen as a way for competitors to steal your idea with most companies. It’s a shame since if it is well implemented and deployed, intellectual properties are safeguarded. By open sourcing the platform of a simple two to four seater car, many companies could work on their individual battery pack management for instance, thus differentiating themselves from their competitors. Is the car industry ready for open sourcing, yes and no. Ford and GM partnering on shared transmissions is a step in the right direction and we are seeing increasingly bilateral moves. It seems increasingly plausible that open sourcing will become an integral part of any car related business model at one point or another, software or hardware. It's true, Joe, it's a challenge, especially in this fairly new automobile field. It will continue to make inroads slowly I believe.